Cardi B and Bruno Mars have released the music video for their recent single “Please Me.” It’s set in an L.A. taco restaurant where Cardi B, Bruno Mars, and their respective entourages show off their dance moves before leaving in a couple of stylish old school cars. The new visual is just the latest entry in a growing collection of collaborations from Cardi B and Bruno Mars. The two have worked together in the past on tracks like the “Finesse” remix, which also received an accompanying video. Cardi B and Bruno Mars performed the “Finesse” remix together at the 60th Grammy Awards in 2018 and had scheduled a joint tour for late last year, though Cardi B was forced to drop out after giving birth to her daughter, Kulture. Cardi’s 2018 album Invasion of Privacy picked up the award for Best Rap Album at this year’s Grammys, beating out Mac Miller, Nipsey Hussle, Pusha T, and Travis Scott. She also performed her recent single “Money” at the awards. Last month, Cardi released her official remix of Blueface’s “Thotiana,” adding some star power to a single that’s currently sitting at No. 13 on the Billboard Hot 100. 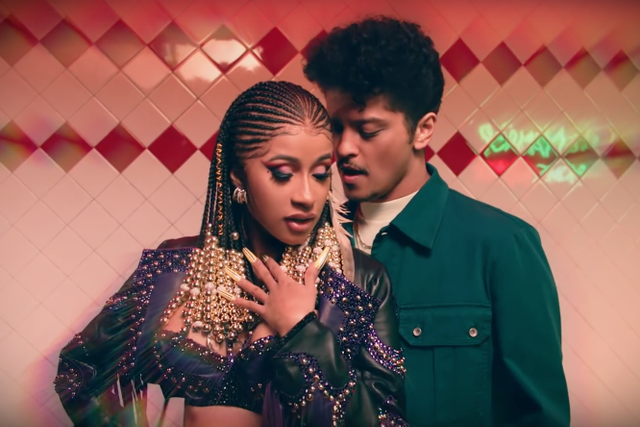 Watch the video for Cardi B and Bruno Mars’ “Please Me” below.